Falling leaf fuse is most commonly used for various coloured effects fireworks even though it can be used in place for regular visco fuse. 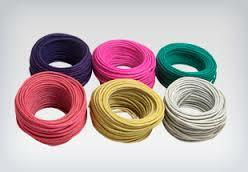 It is a cord with a pyrotechnic composition core that burns green, red, purple, blue, yellow or white. There are three layers that make up the fuse. The first one layer of string is wound around the core, then a second, less tight layer of string is wound in the opposite direction to prevent unravelling. The last layer is a low-nitrate nitrocellulose lacquer to waterproof the strand and to prevent it from falling apart. The fuse burns at 54 seconds per foot. It is typically cut into small sections and placed inside a aerial shell that is fired from a mortar tube or payload for a black powder rocket. At effect time the small sections of fuse ignite and burn slowly while falling towards the ground, hence the name 'Falling Leaf'.